"if you help rake leaves we can have a fire tonight, and oh! the smell of leaves burning, to this day, it is one of my best fall country pleasures. 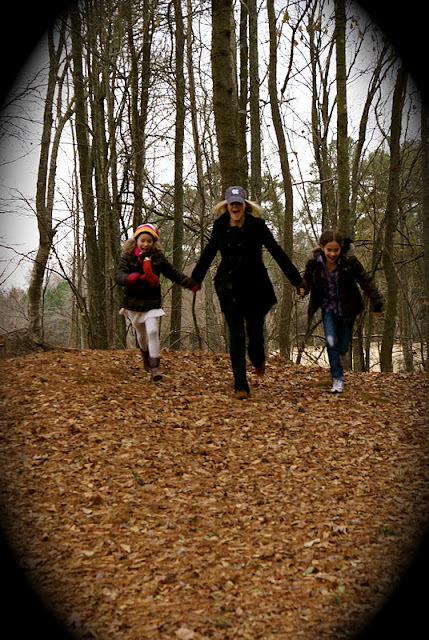 Running and jumping in the leaves.. I remember times spent at my grandmothers leading up to that most welcome time of year known as "Thanksgiving Day", as a matter of fact "Thanksgiving Day"was anticipated with much excitement. It meant going to both grandparent's home and being with family. We started the month out with thankful hearts, because it was at this time that our schools really taught us about the pilgrims coming to America,and how thankful we should be. All month long "Thankfulness" was emphasized in homes, churches, and schools. 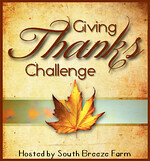 So in honor of this very "thankful" month I have decided to join Leah at South Breeze Farm for Giving Thanks Challenge......... I will try and list each day on my side bar of something that I am thankful for, I will also do some posting about my thankfulness. My personal goal for this month is to cultivate a heart that is not only thankful in November, but all year long. I know we all have very thankful hearts, but to name a specific thankful will be fun, and soul searching, at least for me.One thing for sure you will learn a little more about me as a person. ~smile~ I am also looking forward to learning more about you. Psalms 92:1-2~It is good to give thanks to the Lord, And to sing praises to your name , O Most High; To declare Your loving kindness in the morning, And Your faithfulness every night. Written by Sue, Saturday, Oct. 29, 2011 cold, clouds with rain, brrrr! 40's temps. Do you like to get surprises through the mail? Of course, we all do, now, Sue what a silly question you have asked!! Yesterday dh brought this box to me! Let's see... there is some pretty yellow tissue paper, and what's this bright orange... and get well wishes in those cards! these beautiful ladies, daughter, Susan,granddaughters Susie and Katie!! It seems they had heard through the grapevine that grandma was had been under the weather. So they wanted to make her all better, and oh! how right they were. Grandmama is all better, and back to her normal self, if that is possible! lol "Thank you, my darlings"
I did have a bump in the road, but all is well now! We have been so busy trying to get the farm, and animals ready for winter. 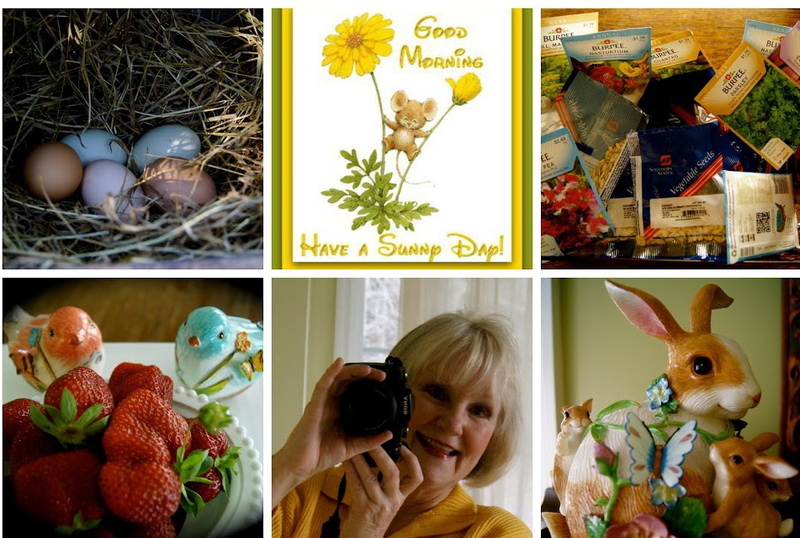 Plus this is the time of year that we begin to plan for next year's growing season and one of the things we do around here is plant our strawberry plants now, so when spring comes we will have a bountiful crop. He's so cute, and Lucy is never far away from her Master! Hopefully the plants you have ordered come in healthy, and these look great, they are called sets. You then humble yourself and crawl up and down the row planting each one, all 500 sets, Yes! 500! ~smile~ or should I say oh! my aching knees. If we were commercial growers we would have a machine, but since this is for us, we do it the old fashion way.>>> down on your knees! LOl. Well Ladies, it is now 3:45 and dh has just reminded me that I need to get my walking done, isn't it nice to have your own personal trainer, btw, one who doesn't even walk with you, his excuse "I get too much exercise",. I think I am going to rename him my "Cheerleader." I will be back this evening to finish visiting! There are so many sights, sounds, and smells, that I love about fall. Gathering the hay for winter is one of them. The hay is cut, and let dry for a day or so. It is then flipped, and dried some more. My sisters and I didn't care for all the working in the fields, we had our minds on other things, or should I say, ahem!!! boys, and girl things.... manicured fingernails, new hair dos, playing our records, Elvis, Pat Boone,.. So through these hardships. ~LOL~ yea right!! we all declared "WE WOULD NEVER EVER MARRY A FARMER, "NEVER"!! Here are the bails ready to be put in the barn! What a beautiful sight for a "farmgirl", and her "farmboy"!! While standing at the fence I could smell the fresh cut hay,... one of the best "farm aromas".... giving thanks to our Heavenly Father for our harvest, God always provides even in a drought,and we have had one of the worst ever here in the South.. We will need this hay come winter to feed our sheep, cows and horses. One of my favorite things to do is to walk to the field with refreshments, and have My"farm guy" ask me if I would like to take a ride on His tractor? Do you even have to ask?? "Be still my heart!" 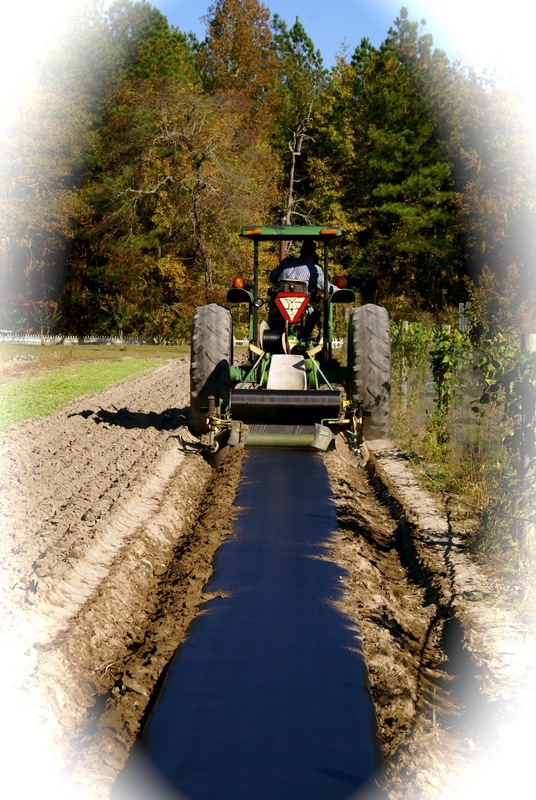 Farming is year round, and it has long hours with it. But it is so rewarding, To be able to put a seed in the ground and see it spring forth, and produce food for you to preserve, and eat fresh,...to be able to have all kinds of animals around you that you learn to love and interact with is worth all the hard work.